Cook the chicken pieces until just cooked with a little bit of salt & pepper (and I added some garlic powder too), drain the juices if you want, then add the can of soup and the spices to your taste. I ended up adding in more cinnamon and coriander because I couldn’t taste them – the garlic and cumin kind of overpowered everything else. I let this mixture simmer at low heat, covered, while I baked up the pita bread. You can also serve this over rice, with or without the pita. The pita just sops up the soup so nicely, though! And again – since this is a ‘lazy’ entry, I’m just posting the link for the pita bread. I was right – this was really tasty, and quite filling (and made me feel all healthy and stuff!). 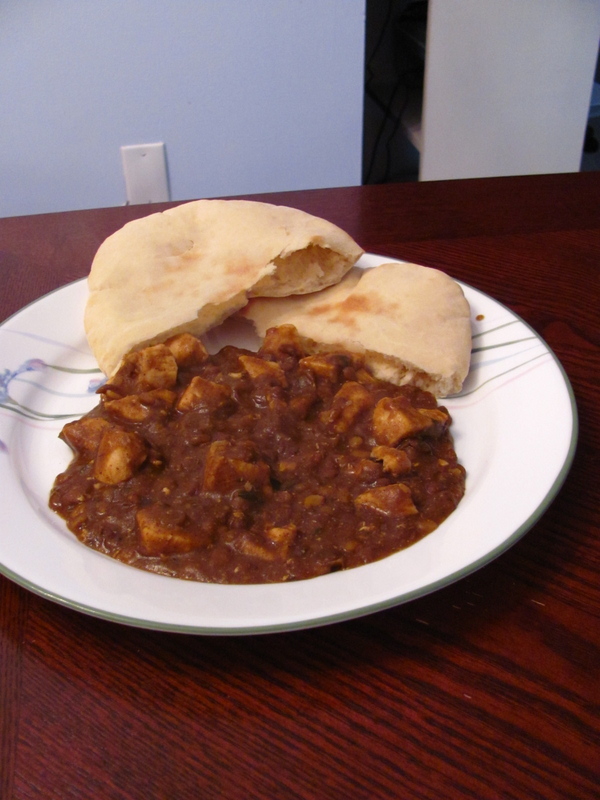 I realize the picture of the chicken and lentils really doesn’t look appetizing, but it really is yummy… You can always just buy the pita bread, but I wanted to try making it cuz I’m odd like that (I also really like baking bread – and I don’t have a bread machine, so I get to knead it all myself! It’s wicked fun – seriously.). I have absolutely no idea how long it’s been since my last post – I could go back and check, but that would just remind me that I’m a slacker. 🙂 I know I missed Christmas, which is a shame, because I took pictures of my Christmas cookies, fully intending to post about them – and that so didn’t happen! Anywho… I was going through the stack of recipes on my living room floor, trying to figure out how I should organize, but then got sidetracked by all of the recipes I wanted to make. I came across a Cook’s Illustrated recipe for Swedish Meatballs, and while I know I’ve had them at least once in my life, I’ve never made them (or any other kind of meatball) so I added it to my menu for this week. They turned out all right, I think – having nothing to compare them to makes it easier for me to say I thought they tasted just fine! Whisk egg and cream together in medium bowl. Stir in bread and set aside. Meanwhile, in stand mixer fitted with paddle attachment, beat pork, onion, nutmeg, allspice, pepper, brown sugar, salt, and baking powder on high speed until smooth and pale, about 2 minutes, scraping bowl as necessary. Using fork, mash bread mixture until no large dry bread chunks remain; add mixture to mixer bowl and beat on high speed until smooth and homogeneous, about 1 minute, scraping bowl as necessary. Add beef and mix on medium-low speed until just incorporated, about 30 seconds, scraping bowl as necessary. Using moistened hands, form generous tablespoons of meat mixture into 1-inch round meatballs until you have 25-30 meatballs. Pour off and discard oil in pan, leaving any fond (browned bits) behind. Return pan to medium-high heat and add butter. When foaming subsides, add flour and cook, whisking constantly, until flour is light brown, about 30 seconds. Slowly whisk in broth, scraping pan bottom to loosen browned bits. Add brown sugar and bring to simmer. Reduce heat to medium and cook until sauce is reduced to about 1 cup, about 5 minutes. Stir in cream and return to simmer. 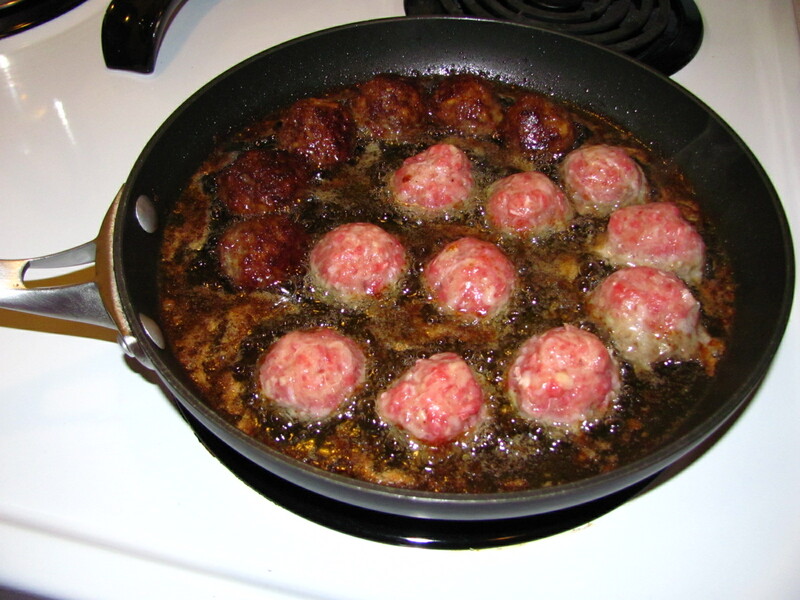 Add meatballs to sauce and simmer, turning occasionally, until heated through, about 5 minutes. Stir in lemon juice, season with salt and pepper, and serve. Like I said, yumminess. I had no idea what constituted a ‘large’ slice of bread, so I just went with Trader Joe’s Canadian White (which, btw, is really good for sandwiches!) – I guess it was fine. I have to say, though, I have honestly never cried so much when cooking with onions as I did with this recipe! Must have been the grating… I wonder if it would turn out just fine if I finely chopped the onions next time… grating it was just a little too much. 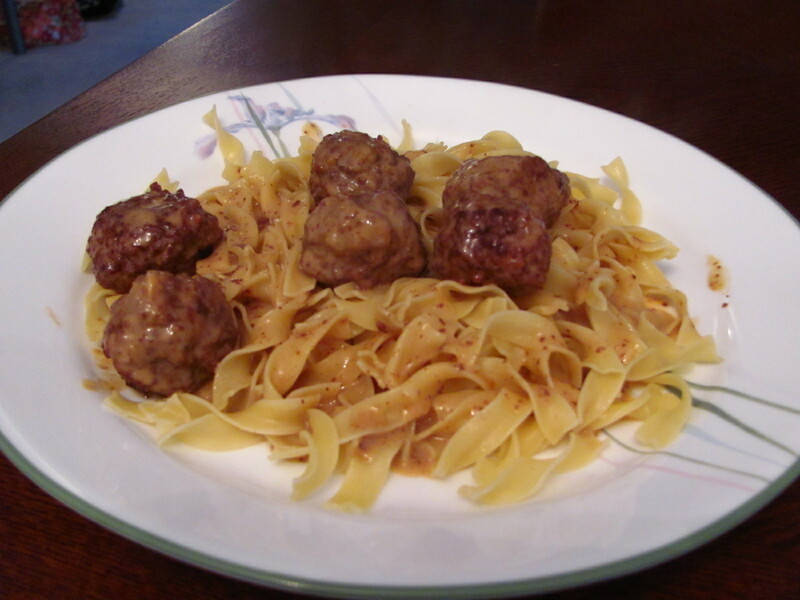 I served my meatballs over egg noodles, although I really want to try them over mashed potatoes too. I’m not sure the sauce is supposed to be that brown, but it tasted okay to me – must have been all the ‘fond’ left (there was quite a bit). Cook’s Illustrated has a few notes that I thought I’d add also. Firstly, the traditional Swedish accompaniments are lingonberry preserves (or cranberry if you can’t find lingonberry) and Swedish Pickled Cucumbers. I had neither of these, so maybe the whole dish would have tasted even better if I had – I’ll just have to head to Ikea at some point and try theirs. Also, if you don’t want this to be quite so sweet (and for a meat dish, it is a little sweet), you can omit the brown sugar in the meat mixture, and reduce the brown sugar in the sauce to 2 tsp. If I had actually paid attention to all the writing in the beginning of the article, I might have made them this way, but now I guess I’ll just have to make them again!